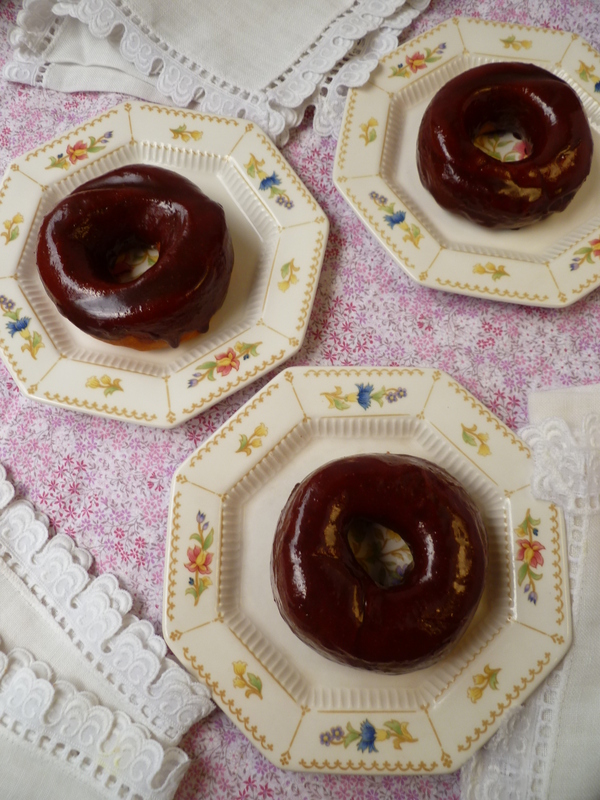 In his friendly and entertaining classic The Compleat Angler (first published in 1653) Izaak Walton said of “the Art of catching fish” that it “is not to be taught by words but practice.” The same may be said for the ability to make a good homemade doughnut. Skill comes with practice. The maker of homemade doughnuts is not necessarily someone who cooks on a regular basis. The doughnut maker may go into the kitchen only on occasion to pursue a calling: the well-made, homemade doughnut. 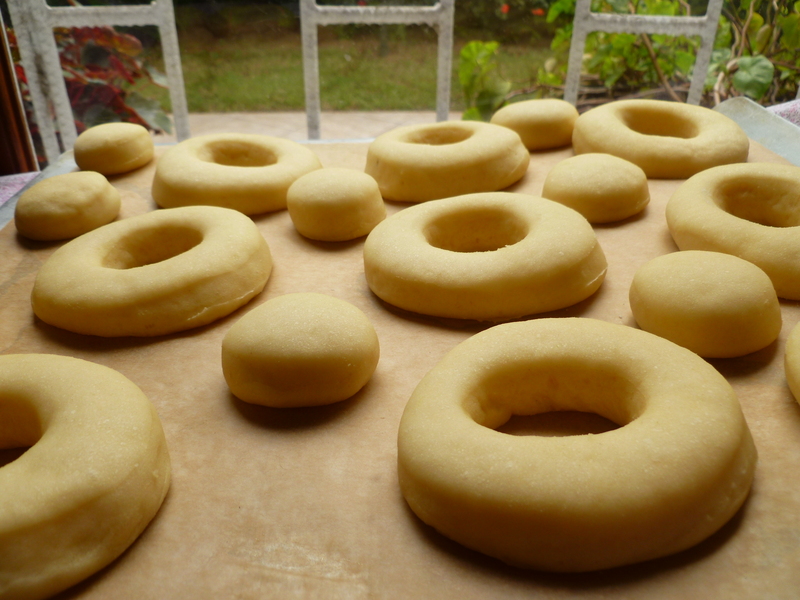 Doughnut making, like fishing, is a pastime, a comfortable pursuit in hours of leisure. It cannot be rushed successfully. Doughnut making is an event and the sine qua non of of the endeavour is Time. 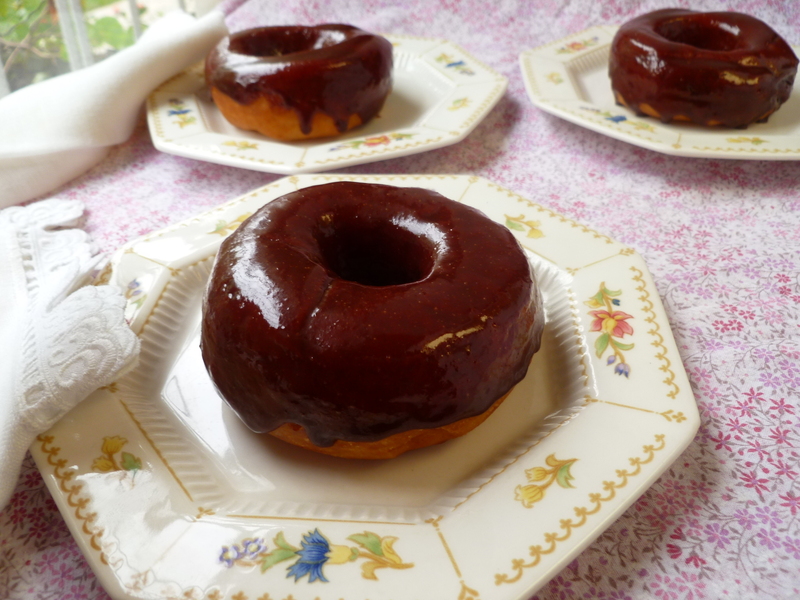 Add to that a couple of practical necessities (a very good recipe and a heavy pot that holds heat well) and you have the fundamentals for engaging in the pleasant endeavour of making the traditional American doughnut. Correction: In the original posting of this recipe, an error was made in listing the order in which the ingredients are added. 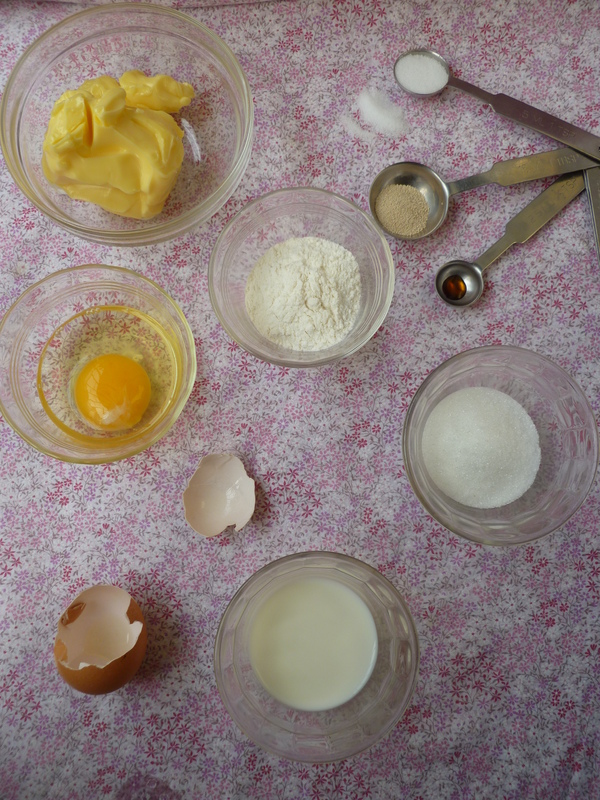 Two cups of the flour, combined with the salt, should be mixed into the egg and sugar mixture before the butter pieces are added. The recipe below now reflects this correction and the dk apologises for poor editing. Note about serving doughnuts for a breakfast: These doughnuts are part of the Occasional Menu: Mixing Breakfast and Business. Making them is a time-intensive proposition and can’t be easily done on the morning of the breakfast. 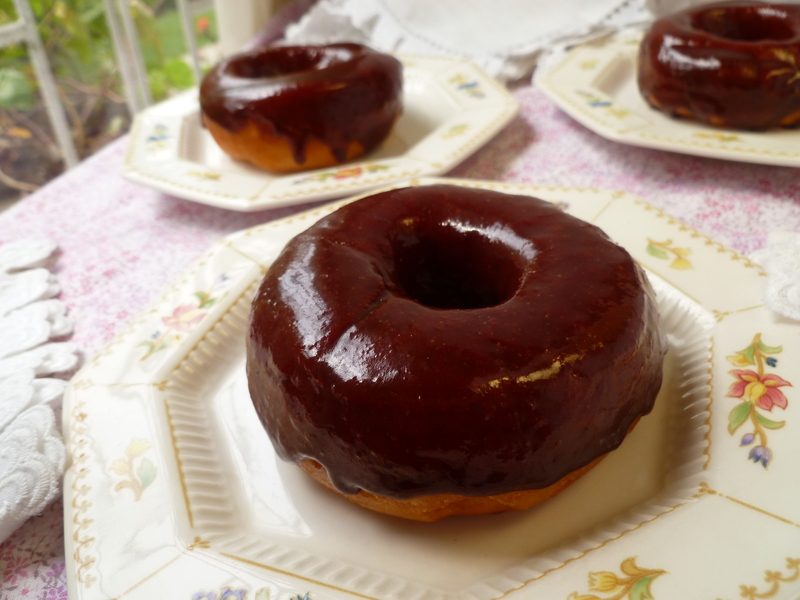 Fortunately, this recipe produces doughnuts that may successfully be made one day in advance. A suggested method for keeping them fresh: Arrange the doughnuts on platters without crowding them, turn large glass salad bowls upside down over the plates of doughnuts and store them overnight in a very cool room…not in a refrigerator. Oil for frying the doughnuts: The amount will depend on the size of the pot; there should be plenty of oil in the pot to allow the doughnuts to float freely as they fry–or, oil to a depth of about 2-inches in the pot. 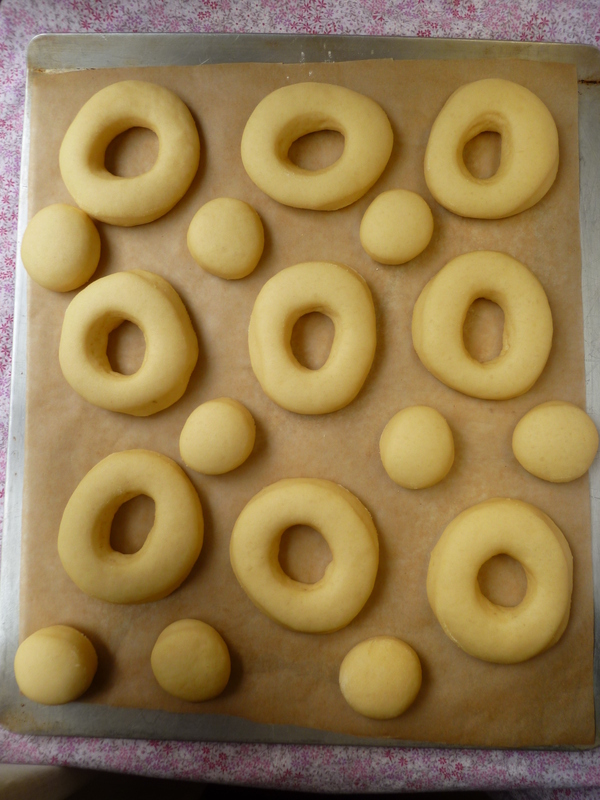 The type of oil used is a matter of preference; the pictured doughnuts were fried in a mixture of Sunflower and Peanut Oils. a Candy/Deep Fry Thermometer is optional but very useful for gauging the oil temperature during frying….or, if you deep fry foods often, you may be fairly expert at judging the heat of the oil without one. 1. Heat the milk until it is warm but not hot. Pour the yeast into the small bowl, add a pinch of sugar and pour in the milk, stirring to dissolve the yeast. Set the bowl aside. The yeast will become active and foamy. 2. Place the egg and sugar in the bowl of the mixer and beat it with the paddle attachment (if the mixer has one). Once the yeast mixture foams, add it to the egg and sugar. Then, add the vanilla. 3. Stir the salt into the flour. Mixing at low speed, gradually add 2 cups of the flour. 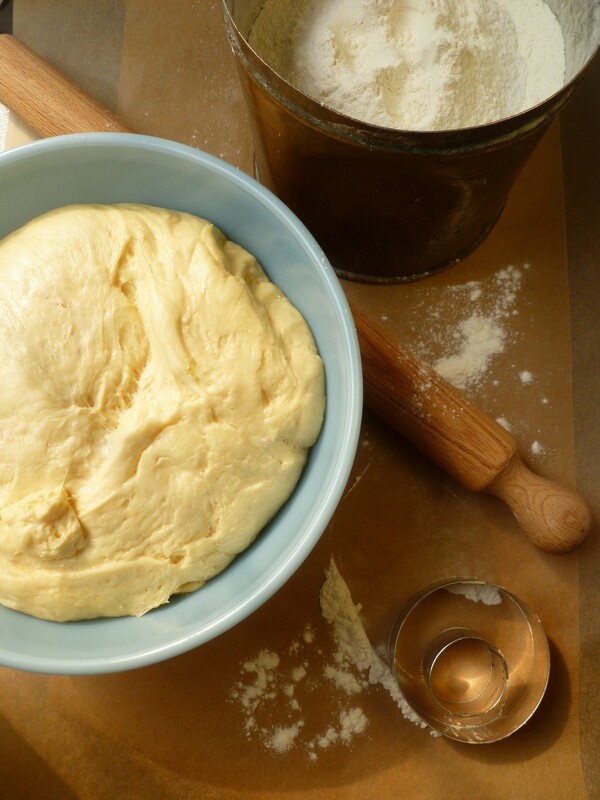 Continue mixing and add the bits of butter, one by one, to form a smooth, sticky dough. 4. Continuing to mix at low speed, gradually add an additional 1 and 1/2 cups of flour (for a total of 3 and 1/2 cups). The dough will still be sticky. Continue beating the dough until it pulls away from the sides of the bowl and forms a cohesive ball. 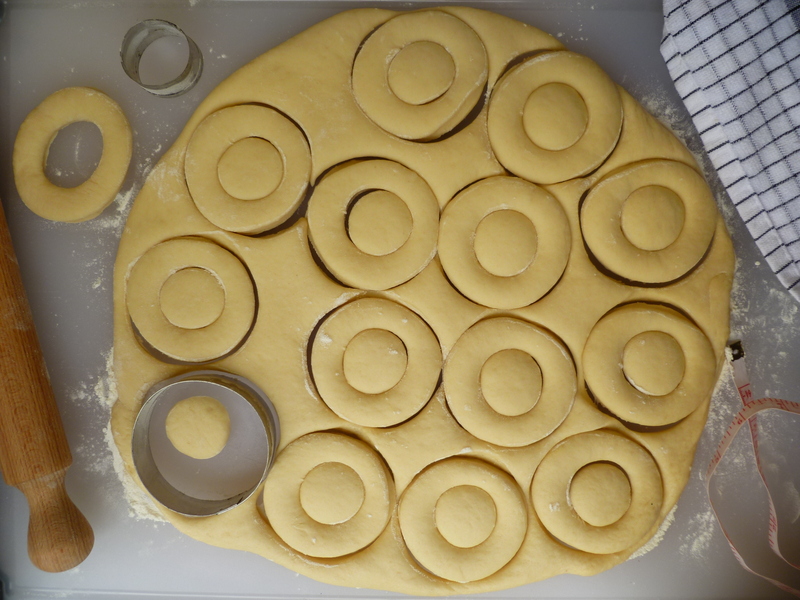 …Gather up the unused dough into a ball, roll it out again and cut out more doughnuts and holes. Continue doing this until all the dough is used. 8. Add the oil to the heavy pot to a depth of at least 2-inches. If you are using a thermometer to gauge the temperature, hook it to the side of the pot and heat the oil over medium heat to a temperature of about 350 F. (A little above this temperature is fine.) Test the oil temperature by frying one of the holes. Place a hole in the oil. Within 2 minutes, one should be able to see a rim of golden brown color rising up the sides of the dough. Turn it with a pair of forks and fry it for about 1 – 2 more minutes until the second side has turned a light golden color. Transfer the hole to a cooling rack placed over a rimmed baking sheet to drain. 9. Fry the doughnuts one at a time, adjusting the burner heat as best you can to keep the oil temperature at 350 F. (Adjusting the oil temperature by keeping the burner heat more or less in the medium range works well.) If the oil temperature rises a little above 350 F, placing a doughnut in to fry will bring the heat down to about the right level. If the temperature goes below 350 F, wait until it rises before frying another doughnut. The frying method is essentially the same as for testing the oil temperature: Place the round of dough in the hot oil. Set the oven’s timer for 2 minutes. In about that amount of time, you should see a golden rim of color creeping up the sides of the round of dough. Turn the doughnut and fry for about 1 more minute or until the second side turns a light golden color. Transfer the doughnut to the cooling rack. Wait until the temperature of the oil again registers about 350 F before frying another doughnut. 10. After all the doughnuts have been fried, fry the holes, 2 or 3 at a time, using the same visual guide for deciding when it’s time to turn the holes, i.e., when the golden color just begins to rise up the sides of the white dough hole. Holes won’t take as long to fry as doughnuts: Doughnuts of this size are done in 3 – 4 minutes; holes fry in 2 – 3 minutes. 11. See the instructions below for making the glaze and glazing the doughnuts. 2 cups of Powdered Sugar: To measure the sugar, sift it directly into a measuring cup. a Double Boiler or a homemade Bain-marie made with a pot partially filled with water and a bowl that fits snugly into its rim. See a photograph of a homemade bain-marie in this previous dk post. A heavy-bottomed pot that holds heat well (as shown in the photo below) is another alternative. 1. 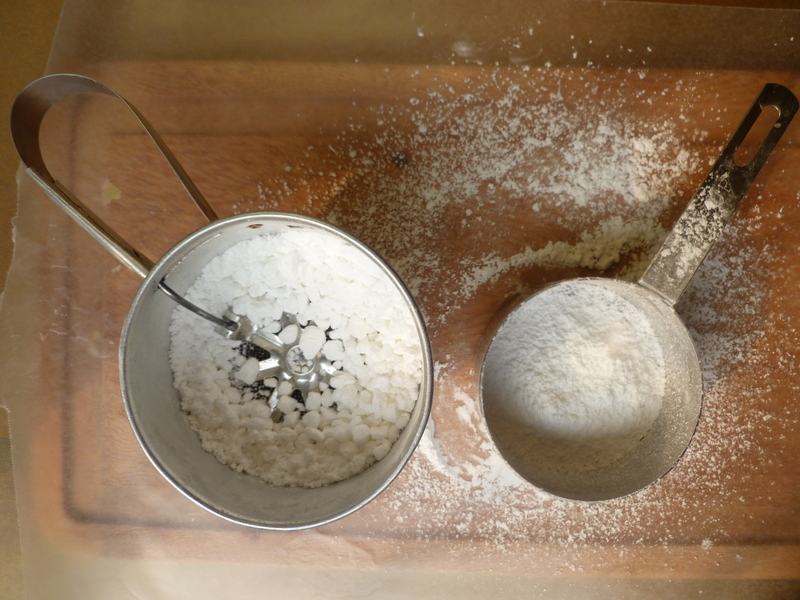 Measure the powdered sugar by sifting it directly into the measuring cup. Set the sugar aside. Place the butter, milk, corn syrup and vanilla in the top part of the double boiler or the bowl of the homemade bain-marie (or the pot) and heat the mixture until it is very hot. 2. Add the chopped chocolate, wait for 1 minute and then stir until it is well combined with the rest of the mixture. 3. Remove the double boiler or bain-marie (or pot) from the heat and whisk in the powdered sugar. 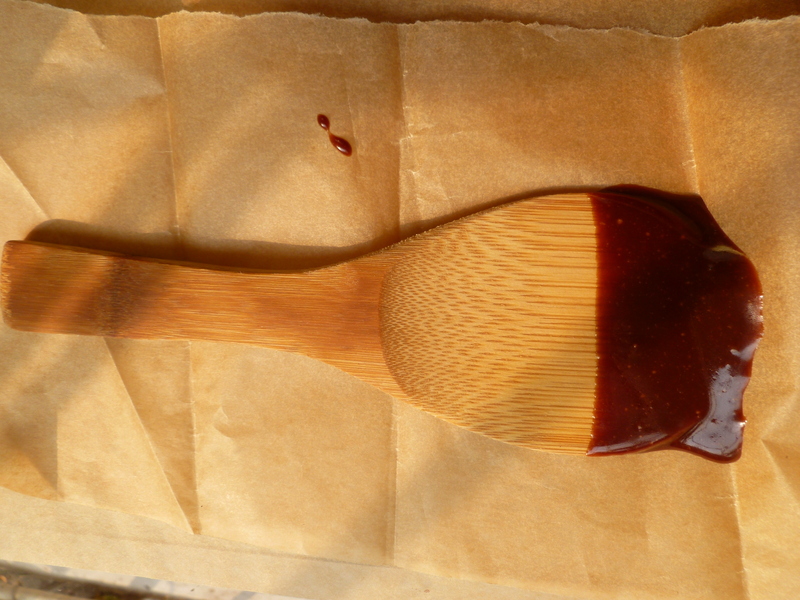 Test the thickness of the glaze: it should coat a wooden spoon, as illustrated in the photos. 4. 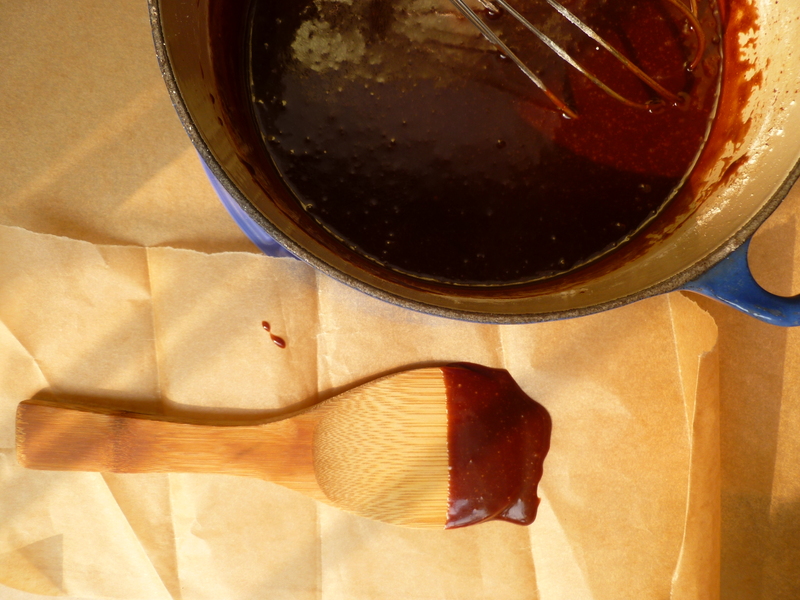 Keep the glaze warm by leaving it over the hot water or in the pot. If the glaze becomes too cool, briefly reheat it. …The doughnuts are excellent, eaten right away. They will keep well overnight and a suggested method is to place them on platters without crowding them–then, turn large glass salad bowls or mixing bowls upside down over them and keep them in a very cool room–but not in a refrigerator. 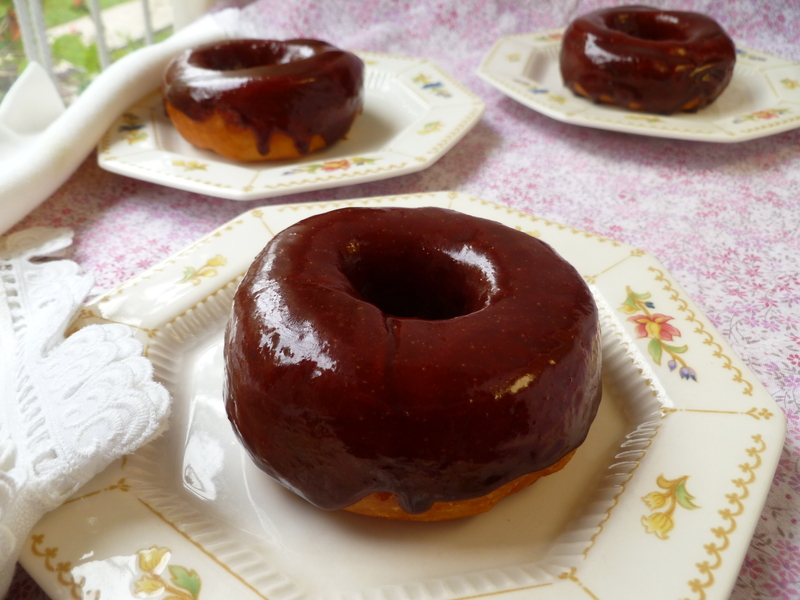 A Note: Homemade Doughnuts with Chocolate Glaze are included in the Occasional Menu: Mixing Breakfast and Business. 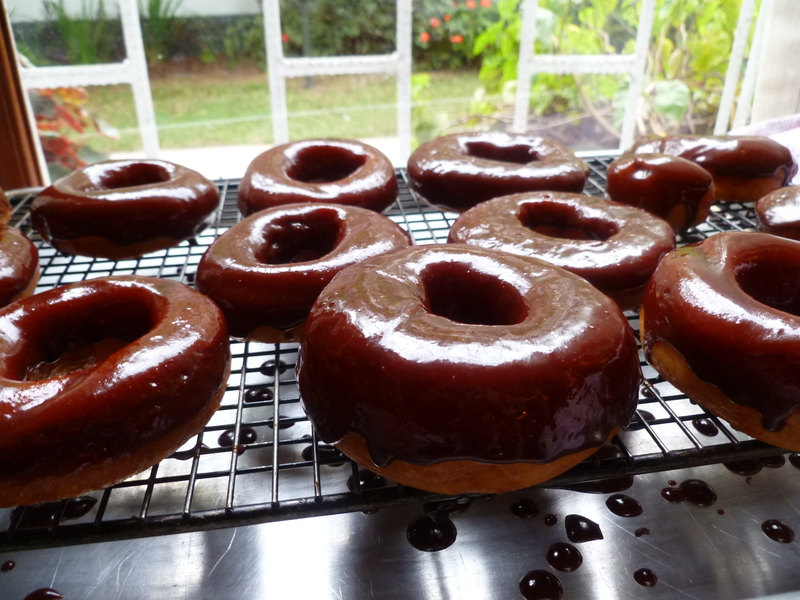 The diplomatickitchen has adapted Mr. Alton Brown’s recipe for Chocolate Doughnut Glaze for these homemade doughnuts. A Second Note: One doesn’t have to be a doughnut maker to appreciate a good doughnut. In the same way, one doesn’t have to enjoy fishing to appreciate Izaak Walton’s The Compleat Angler. A free copy of it is available here at Project Gutenberg.